Show other documents from Etsy.com TIP: Try comparing two versions that are closer to one another. When they're too far apart, the comparison may become unreadable depending on how many changes were made. Jan 2, 2019 Phrasing changes mainly under "5. Messages from Etsy". Dec 9, 2018 Changes to "Buying and Selling", "Third Parties", and "Security". Oct 7, 2018 Clarification under "7. Information Uses, Sharing, & Disclosure" concerning marketing messages. Oct 1, 2018 Several new updates have been made throughout. Oct 14, 2017 Changes to "Choices", "Findability", and "Information Uses, Sharing and Disclosure". Sep 2, 2017 Changes under "Information Collected or Received", "Choices & Control", and "Findability". Jul 27, 2017 Changes under "Information" concerning TRUSTe's Privacy Seal. Apr 18, 2017 Direct Checkout renamed to "Etsy Payments". Feb 14, 2017 References to Etsy Studio added and other clarifications made. Oct 17, 2016 The introductory paragraph has been updated; New section entitled "Export of Data"; Paragraph concerning the Safe Harbor framework has been removed; Mentions of Treasury lists removed; Other phrasing changes. This version has been updated silently, without a change to the posted "last modified" date. This means that without ParanoidPaul, you wouldn't have known the document was updated! The date displayed for this row is when ParanoidPaul detected the change. Aug 31, 2016 Telephone number removed. May 23, 2016 The physical address of the Etsy Support Team has been updated. This version has been updated silently, without a change to the posted "last modified" date. This means that without ParanoidPaul, you wouldn't have known the document was updated! The date displayed for this row is when ParanoidPaul detected the change. May 5, 2016 Terminology update. Apr 5, 2016 Sections updated: "Information Collected or Received", "Uses and Sharing", "Verified Best Practices", "Information Collected or Received", "Data Retention"; New section added called "Your Rights". Nov 17, 2015 Version date changed to November 17, 2015. Nov 11, 2015 Sections "Verified Best Practices", "Information Collected or Received", "Information Uses, Sharing & Disclosure" and "Data Retention" modified. This version has been updated silently, without a change to the posted "last modified" date. This means that without ParanoidPaul, you wouldn't have known the document was updated! The date displayed for this row is when ParanoidPaul detected the change. Aug 29, 2015 The disclaimer at the top concerning when this policy comes into effect for you, has been removed. Jul 29, 2015 A completely new version has been published. I recommend you read the disclaimer at the beginning to see when this updated policy comes into effect for you. This version has been updated silently, without a change to the posted "last modified" date. This means that without ParanoidPaul, you wouldn't have known the document was updated! The date displayed for this row is when ParanoidPaul detected the change. May 26, 2015 Small changes made to the Contact Etsy section. This version has been updated silently, without a change to the posted "last modified" date. This means that without ParanoidPaul, you wouldn't have known the document was updated! The date displayed for this row is when ParanoidPaul detected the change. Jan 5, 2015 The phrasing "If you reside outside of the United States" has been updated to "If you reside outside of North America or South America" in the section "Information Sharing & Disclosure". This version has been updated silently, without a change to the posted "last modified" date. This means that without ParanoidPaul, you wouldn't have known the document was updated! The date displayed for this row is when ParanoidPaul detected the change. Jan 1, 2015 In the section "Information Sharing & Disclosure", the paragraph on users that "reside outside of the United States" has been updated. This version has been updated silently, without a change to the posted "last modified" date. This means that without ParanoidPaul, you wouldn't have known the document was updated! The date displayed for this row is when ParanoidPaul detected the change. 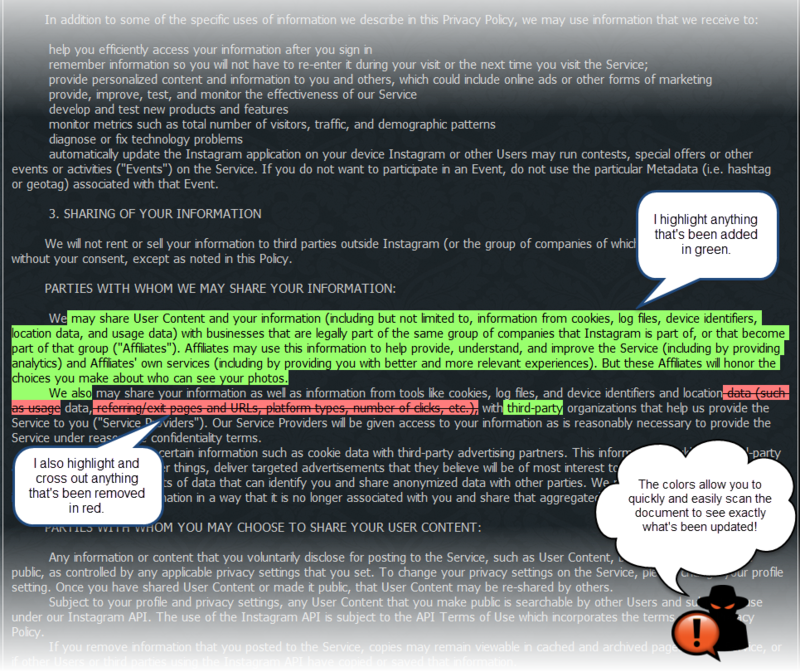 Oct 23, 2014 Minor clarification added to the Information Sharing & Disclosure section. Jun 9, 2014 This is the initial version that ParanoidPaul captured. It is not necessarily the first version of the document. At Etsy, we care deeply about privacy. We believe in transparency, and we’re committed to being upfront about our privacy practices, including how we treat your personal information. We know you care about your privacy too, so we provide settings that allow you to choose how certain information is used by Etsy. This policy explains our privacy practices for Etsy.com (the “Site”), Etsy’s mobile applications (the “Apps”) and services provided by Etsy, Inc. or Etsy Ireland UC (collectively, “Etsy”). If you are located outside of North and South America, Etsy Ireland UC is the data controller and is solely responsible for data collection and processing. By using Etsy, you authorise Etsy to use your information in the United States, Ireland and any other country where Etsy operates. Please be aware that the privacy laws and standards in certain countries, including the rights of authorities to access your personal information, may differ from those applying in the country in which you reside. We will only transfer personal data to these countries where permitted to do so by law and we will take steps to ensure that your personal information continues to enjoy appropriate protections. To use our platform, you will need to provide us with a valid email address and you may be able to choose a username. Depending on the services you choose, we may collect additional information, for example: information in private channels like Conversations, billing or payment information, a telephone number, and a physical address. Please note that for security and performance reasons, such content may need to be accessed by certain Etsy personnel from time to time. Your username is publicly displayed and connected to your Etsy activity. Other people may see the date you joined; ratings, reviews and related photos for items you purchased or sold; your profile information; items you listed for sale; your shop pages and policies; your favourites, followers and those you follow; sold item listings and the number of items sold; and comments you post in our community spaces. You may optionally choose to provide and publicly display your full name and other personal information (such as birthday, gender and location). You may connect to Etsy with an external application, in which case Etsy may receive information from that other service, as explained below. We use the information that we gather from you users in a number of ways. For example, if you purchase an item, we’ll share your shipping information with the seller; we could use your forum suggestions to improve our services; we use data analytics and work with certain third-party service providers for targeted online and offline marketing; and of course, we use your email address to communicate with you. We also partner with service providers and other third parties that collect, use, promote, and analyse information about Etsy members and visitors. You may control the receipt of certain types of communications from Etsy in your account settings. And although Etsy does not currently respond to “do not track” browser headers, you may opt out of online behavioral ads through this link: http://www.aboutads.info/choices/. You also may limit certain tracking by disabling cookies in your web browser. For more information about managing cookies, see our Cookies & Tracking Technologies page. Etsy follows industry best practices and has been awarded TRUSTe's Privacy Seal. The TRUSTe programme covers information that is collected through the Site and the Apps. Click the TRUSTe seal to learn more about our relationship with TRUSTe. We rely on various authorised methods, including your consent, to enable us to transfer your personal data to the US (if you do not live in the US) and to other countries. In some countries, the privacy laws and standards, including the rights of certain authorities to access your personal information, may differ from those that apply in your home country. As an Etsy member you are required to provide a valid email address at registration and you may be able to choose a username or alias that represents your identity on Etsy. Depending on which services you choose to use, Etsy may require additional information to provide the service, such as a shop name, billing and payment information (including billing address, telephone number, credit card information), a telephone number, and/or a physical postal address. As an Etsy seller, if you choose to use our Direct Checkout payment ("Direct Checkout"), Etsy may require information such as your social security number, identification ID or tax ID, date of birth, bank account information, credit card information and/or other proof of identification in order to verify your identity and provide this service to you and to comply with applicable law. We may store credit card information and use it for both billing and payment purposes. Etsy may contact individual shop owners to confidentially request more information about their shops or items listed on the Site, or to ensure compliance with our rules and applicable law. Certain products or services on Etsy may require you to complete an application; information you submit through the application processes will not be displayed publicly and will only be used internally by Etsy, unless otherwise specified. You may optionally choose to provide and publicly display your full name and other personal information (such as birthday, gender, location) in connection with your account and activity. If you do not want this additional information displayed publicly, you can remove it through your Etsy Public Profile page. Your username, Etsy ID or alias is publicly displayed and connected to your Etsy activity. Other people may see the date you joined, reviews, ratings, profile information, items listed for sale, shop pages, sold item listings, and comments in community spaces. Etsy automatically receives and records information from your browser or your mobile device when you visit the Site or use the Apps, such as your IP address or unique device identifier, cookies and data about which pages you visit on the Site or on the Apps and stores it in log files. We may combine this automatically collected information with other information we collect about you. This information helps us to prevent fraud and keep the Site and Apps secure, analyse and understand how the Site and the Apps work for members and visitors, and provide a more personalised experience for members and visitors. For more information about online tracking tools (including flash cookies) and how we use them, see our Cookies & Tracking Technologies page or “Information Uses, Sharing & Disclosure” section below. When you use the Apps, you may choose to share your geo-location details with Etsy in order to use our location-based services. If you have provided your location details but would no longer like to share that information, you may opt out of those services through the settings on the Apps or on your mobile device. We will only share your geo-location details with third parties (like our mapping providers) for the sole purpose of providing you with those services. You may also enable the Apps to access your mobile device’s camera to upload photographs to Etsy. Some members or visitors may connect to Etsy or register an Etsy account using an external third-party application, such as Facebook, or an app developed using the Etsy application programming interface (API). Etsy may receive data from those connected third-party applications. Connecting your Etsy account to third-party applications or services is optional, and when you connect your account to an external app, you will be granting Etsy permission to receive information from the third-party applications. You can also choose to share some of your activity on Etsy on certain social media networks which are connected to your Etsy account. You can modify your settings and revoke your permission under your Etsy account settings. Etsy may receive or obtain information (for example: an email address or IP address) about a person who is not yet a registered Etsy member (a “non-member”) in connection with certain Etsy features, such as when a non-member subscribes to an Etsy newsletter, a member invites a non-member to visit the Site, a member uploads non-member information using the contact uploader feature, a non-member engages in a transaction, or a member sends a gift card code to a non-member. Non-member information is used only for the purposes disclosed when it was submitted to Etsy. A non-member can contact Etsy Support if they do not want Etsy to retain their information. We know that members of our community value having control over their own information, and therefore Etsy gives you the choice of providing, editing or removing certain information, as well as choice over how we contact you. You may change or correct your Etsy account information (except your username) on the Site. You may also remove certain optional information on the Site that you no longer wish to be publicly visible on the Site, such as your full name. For various reasons, Etsy may send you messages about our services or your activity. Some of these messages are required, service-related messages for members (such as transactional messages or legal notices). Other messages are not required, (such as newsletters), and you can control which optional messages you choose to receive by changing your settings in your account. Learn more in the “Messages from Etsy” section of this policy. If you have chosen to connect your account to an external, third-party application, such as Facebook, or an app developed using the Etsy API, you can change your settings and remove permission for the app by changing your account settings. If you no longer wish to use Etsy’s services or receive service-related messages, then you may close your account. Click here to learn how to close your account. You may connect directly with your email service provider, your mobile device’s address book, or a social network account to import your contacts to Etsy. We do not retain the login information for your email service, mobile device, or social network site. You may be able to search for people you know by email address or phone number on the Site or by connecting to your mobile device’s contact list through the Apps. Finding your friends on Etsy helps you connect with them on our platform. For example, you can follow another member’s public activity, such as public Favourites. When you begin following another member’s activity, they will receive an email notification (unless a member has opted-out of receiving this type of email). If you do not want your contacts to be able to find you on Etsy through your email address, phone number, or social networking connections, then you may opt out through your account settings on the Site. If you do not wish to be located on Etsy via your full name, you may remove your name from your public account information on the Site. It is not possible to opt out of being found via your username. On occasion, Etsy will contact you. Primarily, these messages are delivered by email or by push notifications, and every account is required to keep a valid email address on file to receive messages. Etsy may contact you by telephone to provide member support or for transaction related purposes if you give us permission to call you. Additionally, Etsy may send you an SMS message or physical mail in order to provide you with customer support or to provide you with information about products and features you may find of interest. You may update your contact preferences in your account settings. Some messages from Etsy are service-related and required for members. Examples of service-related messages include an email address confirmation/welcome email when you register your account, notification of an order, and correspondence with Etsy’s support team. You may not opt out of receiving service-related messages from Etsy, unless you close your account. Etsy may also send you messages related to certain features or your activity on the Site or Apps. Etsy may send you news or updates about changes to our Site, Apps, or services. From time to time, we may develop new types of messages and share them with you to inform you about our services. Primarily, members will receive these messages via email or push notifications through the Apps, but you may choose to opt out of receiving different types of messages through the settings on your Etsy account or mobile device. Etsy offers optional email newsletters. When you register for an account, or choose to subscribe to a newsletter, you will receive newsletters from us. Newsletters are available to both members and non-members. Members may subscribe or unsubscribe from optional newsletters under account settings or by following the instructions contained in the newsletter emails. Non-members may subscribe by providing an email address, which will only be used by Etsy for these newsletters. Non-members may unsubscribe from newsletters by following the instructions contained in the newsletter emails. A contact-importer feature is available to help you locate and connect with your friends and contacts who may be members of Etsy (see Findability). If someone in your contact list is not already a member, you may invite them to join Etsy and an email will be sent to them on your behalf. Recipients of email invitations may opt out of receiving future invitations by following instructions in the email invitation message. You may only send an invitation to someone who has given you consent to receive one. Etsy is both a marketplace and a community. We offer several features that allow members to connect and communicate in public or semi-public spaces, such as Forums and Teams. Please use common sense and good judgment when posting in these community spaces or sharing your personal information with others on Etsy. Be aware that any personal information you submit there can be read, collected, or used by others, or could be used to send you unsolicited messages. Etsy generally does not remove content from community spaces, and your posts may remain public after your account is closed. You are responsible for the personal information you choose to post in community spaces on Etsy. Another Etsy member may follow your public activity on Etsy to receive updates, such as when you add an item to your public Favourites. You may choose to make certain activities private through your account settings on the Site. After a member has begun following your activity, you have the option to block that member through the Site if you do not wish to share your updates with that specific person. We respect your privacy. Etsy will not disclose your name, email address or other personal information to third parties without your consent, except as specified in this policy. We generally use the information to provide and improve our services and products, for billing and payments, for identification and authentication, for targeted online and offline marketing, to contact members or interested parties, and for general research and aggregate reporting. Etsy limits access to your personal information by Etsy personnel to those whom we believe reasonably need that information to provide products or services to you or in order to do their jobs. Please review our Requests for Information Policy to learn more about how Etsy responds to requests for records or information about members of Etsy’s community. We also may disclose personal information to parties in connection with an investigation of fraud, intellectual property infringement, piracy, or other unlawful activity in accordance with our Intellectual Property Policy. In such events, Etsy may disclose a name, address, country, phone number, email address and company name. Etsy is affiliated with a variety of businesses and works closely with them. These businesses may offer promotions (including email promotions) or sell items or services to you through Etsy’s services. Etsy may also provide services or sell products jointly with affiliated businesses. When an affiliated business is associated with your transaction, we may share information related to the transaction with that affiliated business to facilitate your transaction. Etsy may share demographic information with business partners, but it will always be aggregated and anonymised, so personally-identifiable information is not revealed. Etsy may engage third party companies and individuals (such as payment processors, research companies, analytics and security providers) to help provide our services. These third parties have limited access to your information only to perform these tasks on our behalf and are obligated to Etsy not to disclose or use your information for other purposes. We can only speak for ourselves; this policy does not apply to the practices of third parties that Etsy does not own or control, or individuals that Etsy does not employ or manage. If you provide your information to others, different practices may apply to the use or disclosure of the information you provide to them. Etsy does not control the privacy policies of third parties, including other Etsy members. Etsy is not responsible for the privacy or security practices of Etsy members or other websites on the Internet, even those linked to or from the Etsy Site or Apps. We encourage you to ask questions before you disclose your personal information to others. The security of your personal information is important to us. Your Etsy account information is protected by a password. It is important that you protect against unauthorised access to your account and information by choosing your password carefully, and keeping your password and computer secure, such as by signing out after using our services. Etsy encrypts sensitive information (such as credit card numbers) using secure socket layer technology (SSL). Etsy follows generally accepted industry standards to protect the personal information submitted to us, both during transmission and once Etsy receives it. Unfortunately, no method of transmission over the Internet, or method of electronic storage, is 100% secure. Therefore, while we strive to protect your personal information, we can't guarantee its absolute security. Etsy offers optional advanced security settings for members, such as two-factor authentication for signing in, full-site SSL, and login history; you can enable these options under your account settings. Etsy will retain your information only for as long as is necessary for the purposes set out in this policy, for as long as your account is active, or as needed to provide you services. If you no longer want Etsy to use your information to provide you services, you may close your account. Etsy will retain and use your information to the extent necessary to comply with our legal obligations, resolve disputes, and enforce our agreements. Please note that closing your account may not free up your email address, username, or shop name for reuse on a new account. If you are not satisfied with our response you can contact TRUSTe. If you'd like to be notified when Etsy.com makes updates to documents like this, choose which ones you'd like to subscribe to today (it's free! ).